How do we protect the protectors of the environment? 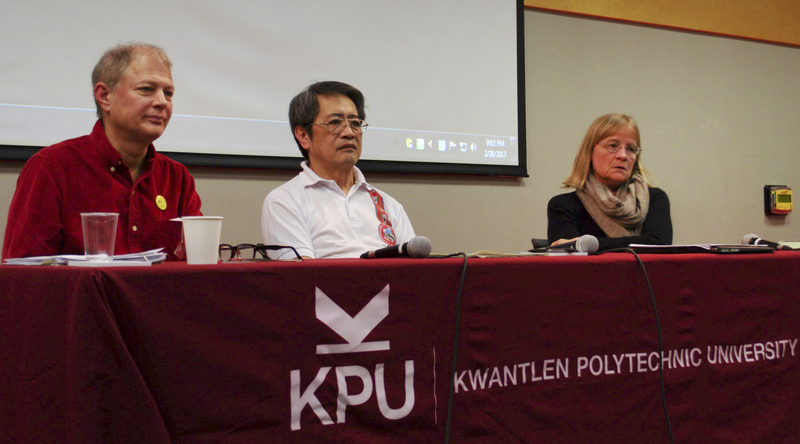 The Kwantlen Students Association invited a panel of experts to discuss the worldwide issue of violence perpetrated against those fighting to protect the health of our planet. Environmentalists have been targeted all over the world because they threaten exiting power structures and often corporate interests. The panel, which was held on February 28th was organised by KSA Vice President Student Life Natasha Lopes after being approached by KPU academic and career preparation instructor Jerry Murphy due to a mutual interest in the topic. Lopes says that she decided to put the event together because she believes that there is a lack of dialogue here in Canada about attacks on the environment and its defenders outside of the North American bubble. The experts who came to KPU to speak on the issue include Amnesty International Canada Activism Coordinator Don Wright, Heather Neun of Lawyers Rights Watch Canada, and Dr. Chandu Claver who is a member of the Indigenous Aragot tribe of the Northern Philippines and a representative of the Cordillera People’s Alliance. Wright spoke in particular about the situation faced by environmentalists in Honduras and Guatemala. According to a report by Amnesty international which was discussed extensively activists in these countries who are overwhelmingly indigenous are systematically killed and imprisoned as they fight for territory rights and to protect the land from corporate interests. Neun is a lawyer practicing human rights and labor law. Neun spoke about plight of activists and lawyers who have been the subject of horrendous human rights violations while challenging international corporations exploiting resources in South America, particularly in Columbia. Neun was a delegate to the International Caravana of Jurists to Colombia in 2012 and 2014. Finally, Claver gave a first hand account of the fight for environmental protection in the Philippines. Claver was forced to flee his native Philippines after he and his family suffered violence for speaking out on the issue He continues his fight from Canada. Claver points out that the organisations which are exploiting the environment in the Philippines are international in their roots and many of them are based right here in Canada. This makes it the responsibility of everyone in the international community to speak out on behalf of the environment, not just those in the areas directly affected. This event was one of a series off panels being planned by the KSA to bring attention to and educate students on a range of issues that organizers see as important. As of now, Lopes is unable to talk about what future topics might be.